Alright, I'm editing bwHUD and I'm trying to get the ammo in reserve to stay white but having some problems with that. I changed the colour of AmmoInReserve in HudAmmoWeapons.res, this works fine until the ammo counter changes to red when low, it resets ammo in reserve back to being green like it was before for some reason. I'm guessing there's another file somewhere to change this, but I can't for the life of me find it. 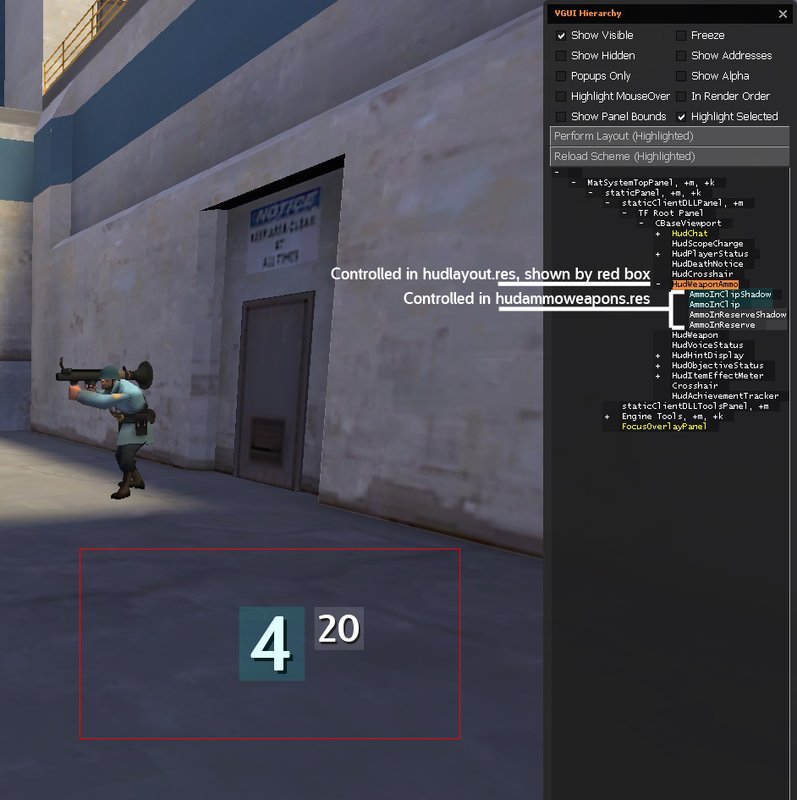 Alright, I'm editing [url=http://teamfortress.tv/thread/16659/bwhud]bwHUD[/url] and I'm trying to get the ammo in reserve to stay white but having some problems with that. #301 hudanimations_tf.txt in scripts. find event HudLowAmmoPulse/LowAmmoPulse. change the lines relevant to AmmoInClip and AmmoNoClip so that fgcolor is white instead of red. Is it possible to rotate "CTFImagePanel"s only using the variables? How can I change the background from the loading screen and make the loading window down right smaller plus to change it's colours? Hey! Im real new to customizing huds. The HUD Im trying to modify is BastHUD. Im looking to change the size of the health, ammo and cooldown bars (for cloak or mad milk etc.). I curious to as what .res files I would need to alter and which numbers I would need to change. Looking to hear back, thanks! 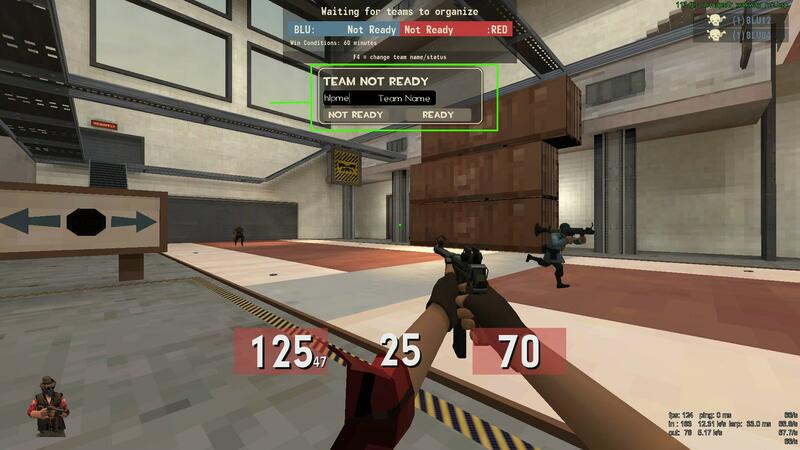 Which font controls the name,score, and ping in scoreboard? how do i (re)move the "beat blus time to win" thing ? 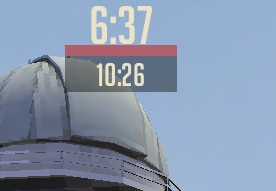 NoFapWhich font controls the name,score, and ping in scoreboard? Firehow do i (re)move the "beat blus time to win" thing ? I believe that's controlled in hudstopwatch.res, can't recall what entry it is specifically though. If it's not that, I'd check hudteamgoaltournament.res. [quote=Fire]how do i (re)move the "beat blus time to win" thing ? 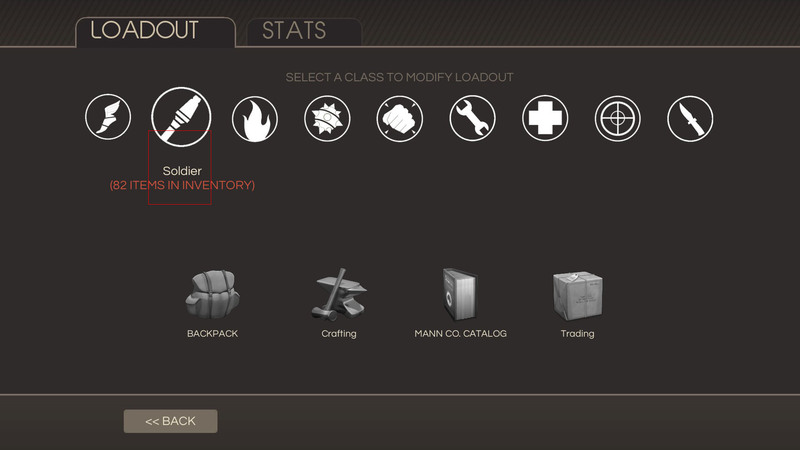 Is there any way to change the callout menu (Dialog with Medic, Spy, Incoming)? I know the bg can be changed in clientscheme, but I really want to turn the corner radius on it off, is there any way? The text under the Medic's name is cut off. What's the .res file and which lines do i have to modify to fix it?This happens in spectator mode only. And a second question how can i change the backgrounds for the loading screen when you are joining a server? Is it possible to remove the black box around the map time limit? Slayer6The text under the Medic's name is cut off. What's the .res file and which lines do i have to modify to fix it?This happens in spectator mode only. Second Question, I think the loading screen stuff is found in chapterbackgrounds.txt, but I'm not 100% sure on that. 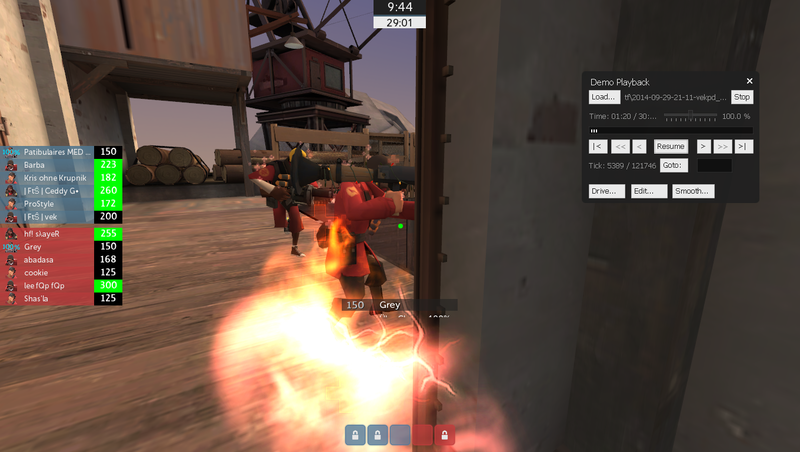 [quote=Slayer6]The text under the Medic's name is cut off. What's the .res file and which lines do i have to modify to fix it?This happens in spectator mode only. anyone know how I could change/add a respawn timer up when I'm dead in tournament mode? WhiskerBiscuit Sexy_HippoWhen i edit my ammo position im trying to get it near the bottom of the screen, it cuts off half of the numbers any fix? CTRL + F "HudWeaponAmmo" in hudlayout.res. It's getting cut off because you're moving elements from resource\ui\hudammoweapons and they're exiting the invisible boundaries of HudWeaponAmmo from hudlayout. When you change the xpos/ypos in HudWeaponAmmo, be sure to use c-values (so it's in the same place on other resolutions). If you move something from hudammoweapons and gets cut off, you're probably moving it out side of the red boundaries. How do i move the boundries? through hudammoweapons.res? CTRL + F "HudWeaponAmmo" in hudlayout.res. It's getting cut off because you're moving elements from resource\ui\hudammoweapons and they're exiting the invisible boundaries of HudWeaponAmmo from hudlayout. When you change the xpos/ypos in HudWeaponAmmo, be sure to use c-values (so it's in the same place on other resolutions). I'm editing the default hud to my liking but I can't seem to align the positive health pickups/regen to the right of their bounding box so I can position it just to the left of my health plus. textAlignment (east/right), pincorner, changing the hudanimations_tf 'ResourcePickup' with r0 did nothing, how do I get this text to align to the right? DjodorIs it possible to remove the black box around the map time limit? Alannyanyone know how I could change/add a respawn timer up when I'm dead in tournament mode? These "popup numbers" can't be aligned as far as I know. Just position HudHealthAccount further left so there's space for 3 digits to the right. ColdBalls Slayer6The text under the Medic's name is cut off. What's the .res file and which lines do i have to modify to fix it?This happens in spectator mode only. [quote=ColdBalls][quote=Slayer6]The text under the Medic's name is cut off. What's the .res file and which lines do i have to modify to fix it?This happens in spectator mode only. Is it possible to edit the voicemenu commands or the commands the menu options are linked to? As in, would it be possible to edit a voicemenu to ask "Which Medigun are you using" and have options 1-3, or 4 (Vaccinator, not really viable for comp if it's not banned) , list Medigun names instead of say "Go, go, go! ", "Spy! ", etc. ? Can someone tell me how to make my own backgrounds in the main menu/main screen? I've been trying to move the area (depicted by the red box) where you hover over to see the class icon enlarge and the text to pop up. Anyone know's how to do this? DomooCan someone tell me how to make my own backgrounds in the main menu/main screen? How would I go about changing the centre uber % to blue? How would I go about to change both the uber %s from green to the same whitish colour as my health? Where do I go to edit this stuff? SpannzerWhere do I go to edit this stuff? f_blue SpannzerWhere do I go to edit this stuff? Not sure but resource/ui/hudtournamentsetup.res? Would someone be able to tell me which file is involved in these two screens before the team selection, along with how it would be possible to make pressing E continue you on.